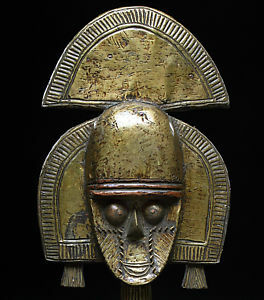 Types of Art: The Dogon are best known for their extensive carving of masks and wooden figurative art. The primary colors used by the Dogon are usually red, black, and white, and popular patterns include spirals and checkerboard motifs, both of which can be traced to their origin stories. Religion: Dogon religion is defined primarily through the worshiping of the ancestors and the spirits whom they encountered as they moved across the Western Sudan. The Awa society is responsible for carrying out the rituals, which allow the deceased to leave the world of the living and enter the world of the dead. Public rites include funerary rites (bago bundo) and the dama ceremony, which marks the end of the mourning period. Awa society members are also responsible for planning the sigui ceremonies, which commence every sixty years to hand on the function of the dead initiates to the new recruits. All of these rites involve masking traditions and are carried out only by initiated males who have learned the techniques needed to impersonate the supernaturals. The leader of the Awa society is the olaburu who is a master of the language of the bush (sigi so). The society is divided in accordance with age-grades, ignoring traditional lineage and hierarchical ordering within the village.